In the background of my normally scheduled reading, I've been indulging in the last of the Harry Potter series. It all started as bedtime reading for the kids each night. But after finishing the Goblet of Fire and then the first several chapters of the Half Blood Prince, I ended up reading the books on my own. Just at lunchtime today, I finished reading the Deathly Hallows. The last two books are my favorite in the series. I really enjoyed reading HBP and DH. For me, there are two factors that made these books so enjoyable. First, the uncovering of a mystery (ie Dumbledore showing Harry all those memories and teaching him about the quest to destroy the Horcruxes) and second the actual quest to find and destroy the Horcruxes. And along with that quest, the discovery of the Deathly Hallows and the uncovering of the mystery of Albus Dumbledore. The fact that so much is uncovered and revealed makes these last two books exciting. On the flip side, what made the excitement about the flood of information in these last two books possible was the slow dripping of information in the several books prior. The tension and piquing in interest those first books created, allowed for the unrestrained pleasure of reading the last two books. Rowling did a fantastic job managing and releasing that tension. Although it all seems a bit hoaky, I still felt affected by the themes of the books: love, courage, loyalty and knowledge. Love is all over the place - Lily's love for Harry, James and Severus; Harry's love for his parents, Dumbledore and his friends, Lupin and Tonks, Ron and Hermione, Dobby's love for Harry, the Dumbledore family and on and on and on. But time and time again, people in the story do things that don't quite seem logical - and they do those things in the name of love. I whole-heartedly agree with this theme of love - it is indeed a deep, strong and unexplainable magic. Courage - the characteristic of Gryffindor. Harry and most of his friends have it. Harry shows it over and over again. Of all the things I learned from Harry Potter, courage would be at the top of the list. Sometimes he jumped in to things head first without giving it much thought. Sometimes things didn't work out, but persistence and courage eventually won out. Harry eventually began to uncover the big picture and once he was armed with knowledge, his courage didn't fade. In fact, it made his courage even all the more admirable. I kind of see this same type of courage with Jack Aubrey - he'll sometimes run headlong with a fly-by-the-seat-of-the-pants plan. Other times he'll plan more carefully - but always he's ready and willing to engage. Loyalty and knowledge - I don't have a whole lot to say here. But the theme of loyalty is obviously tied closely to his love for his friends. As for knowledge - the whole series takes place in a school! But those 1 on 1 lessons with Dumbledore and the whole uncovering of the mysteries of the Hallows and Horcruxes underscores the need for knowledge. When you first read about what a Horcrux and Deathly Hallow is, you can't help but feel this yearning to go searching for some mystery. All the books seem to bring that desire out. 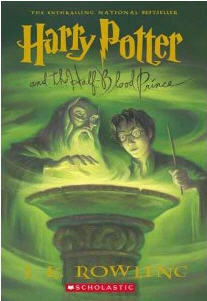 In summary - Harry Potter is a fantastic series and the last two books are simply amazing and entertaining. It is amazing to think how easily and quickly I read those monster books - but that is a tribute to the author who makes reading them so easy.